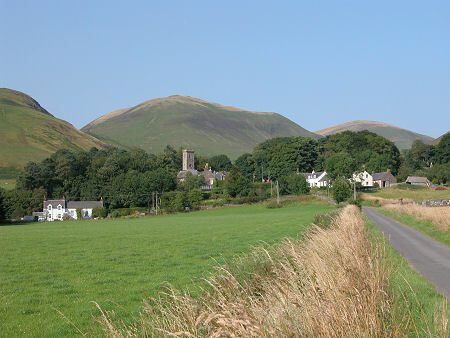 Durisdeer is a tiny hamlet nestling at the foot of the Lowther Hills. 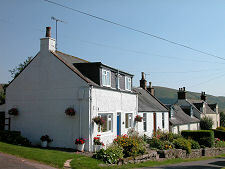 A mile off the A702 as it links Carronbridge in Nithsdale with Elvanfoot overlooking the M74, Durisdeer is accessed by two very narrow roads that go no further than the village itself. As a result it is little known and seldom visited. It wasn't always so. When the Romans came this way they built their road between Nithsdale and Clydesdale on a more direct route than taken by today's A702. It went through the Dalveen Pass to the north east of Durisdeer, a route that took it right through the site of today's village. A mile or so along a track north east of Durisdeer you find the site of a Roman fortlet, one of the best preserved in Britain with protective ramparts and ditch still visible. 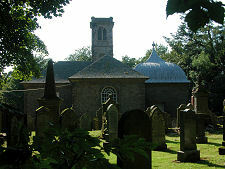 The biggest surprise in Durisdeer is its Parish Church, built on a scale out of all proportion to the village itself. 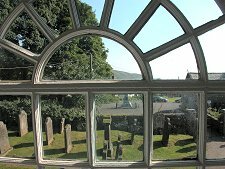 This is explained by Durisdeer's role as parish kirkton for Drumlanrig, covering the castle and large estates of the Dukes of Queensberry to the north west. There has been a church on this site since medieval times. In 1719 it was largely demolished and during the 1720s the church you see today appeared in its place. Inside you find a T-shaped church with a large pulpit at its focal point, box pews, and galleries in all three "wings". The inside of the church actually seems rather small given the expectations raised by the exterior. 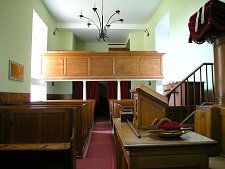 Part of the answer for lies in west end of the church, which was built as a two storey session house and retiring rooms for the Duke of Queensberry. And part lies in the church's most remarkable feature, the Queensberry Aisle. A hint of this is given from the main church, through a low curved window behind the pulpit revealing a marble-tiled floor beyond. But to get a real feel for the splendour of the Queensberry Aisle you need to exit the church and re-enter via a door near the north east corner. This gives access to a mausoleum built for the First Duke of Queensberry between 1695 and 1708. Originally built against the medieval church, this then had the 1720s church grafted onto it after the medieval church's demolition. Inside you find a marble tiled floor, in the centre of which is the black marble slab marking the entrance to the burial vault. Above it is a huge and intricately carved marble canopy standing on four marble columns. 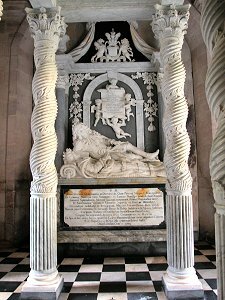 On the back wall is the large marble memorial to the Second Duke of Queensberry and his wife Mary, which was erected in 1713. 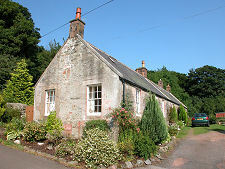 There is more to Durisdeer than just its church: and nearby are a collection of cottages and farmhouses, and the manse. 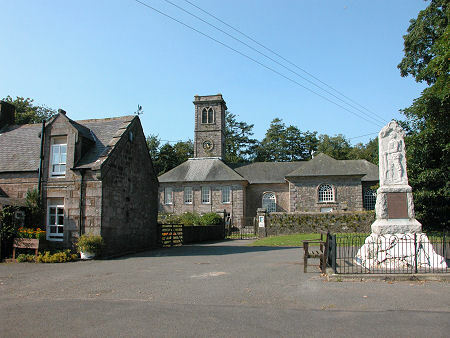 And in the centre of the open area outside the church is the war memorial. Durisdeer may seem remote and sparsely populated today, but it hasn't always been the case. 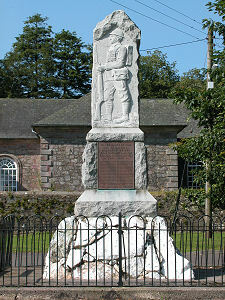 The memorial carries the names of 33 men from the parish who didn't return to these hills after the First World War.